The health of the ocean is inextricably linked to human wellbeing, and fisheries are vital for food security, livelihoods and the sustainable development of billions of people worldwide. In 2014, fishery exports from developing countries were valued at US$80 billion, higher than all other food commodities (including meat, rice and sugar) combined1. However, the protection of this resource is an ongoing challenge for the global community. Since 2009, the percentage of overfished stocks worldwide has hovered around 30 per cent1, and poorly managed fisheries have contributed to the degradation of marine ecosystems around the world. While recent research highlights the efforts of fisheries in developed countries to improve sustainability, significant challenges remain, particularly in the developing world where 73 per cent of seafood is caught2. In this context, restoring ocean health and ensuring the sustainable use of marine resources requires a holistic approach, drawing on science and environmental conservation as well as addressing social and economic challenges. The United Nations (UN) Sustainable Development Goal 14 (Life Below Water) can’t be achieved without considering the other UN Sustainable Development Goals (SDGs, or Goals) which encompass the alleviation of poverty, hunger, and poor working conditions and the promotion of economic growth, sustainable consumption and climate action. Equally, ending overfishing has been identified as a pre-requisite to achieve many targets across the Goals3. Credible certification and eco-labelling programmes are one tool with applicability across a broad range of the Goals and are part of the solution for ending overfishing globally2. The Marine Stewardship Council (MSC) is an international non-profit organisation established to address the problem of unsustainable fishing and safeguard seafood supplies for the future. 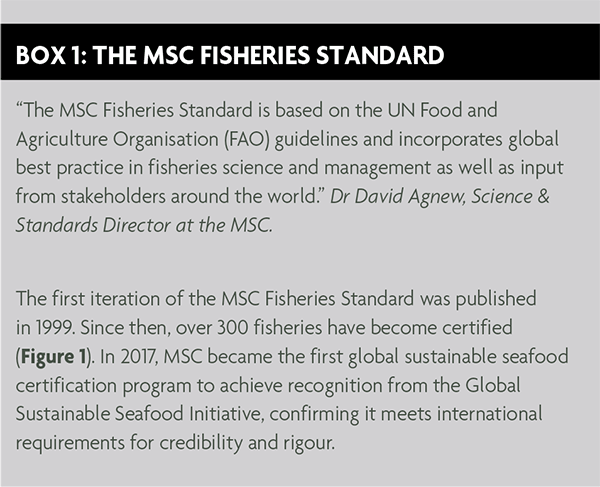 The MSC is widely recognised as a leader in wild capture certification, with 12 per cent of global marine catch currently certified. The MSC’s science-based ecolabel and fishery certification program contributes to the health of the world’s oceans by recognising and rewarding environmentally sustainable fishing practices and influencing the choices people make when buying seafood. Our theory of change holds that consumer desire and market demand for products bearing our ecolabel encourages fisheries to achieve MSC certification, and that the efforts of these fisheries to demonstrate sustainability result in positive change on the water. As part of the Concept Paper on Partnership Dialogue 4: Making Fisheries Sustainable at the UN Ocean Conference, the MSC program was recognised as a promising tool for developing partnerships and sustainable seafood supply chains4. One example of a global partnership supported by the MSC is the ‘Seafood Business for Ocean Stewardship’ initiative. Led by the Stockholm Resilience Centre, the initiative connects the global seafood business to science in support of Goal 14 and includes an ocean stewardship pledge from 10 of the world’s largest seafood companies5. By incentivising best practice in the fishing industry, the MSC contributes to several of Goal 14’s targets including ending overfishing, implementing ecosystem management, and eliminating illegal, unreported and unregulated fishing6. Every year, the MSC carries out a comprehensive analysis of the impact of its program in safeguarding marine resources. The MSC Global Impacts Report 2017 contains the results of this analysis, and includes more than a thousand examples of positive change made by certified fisheries to safeguard fish stocks and marine habitats7. 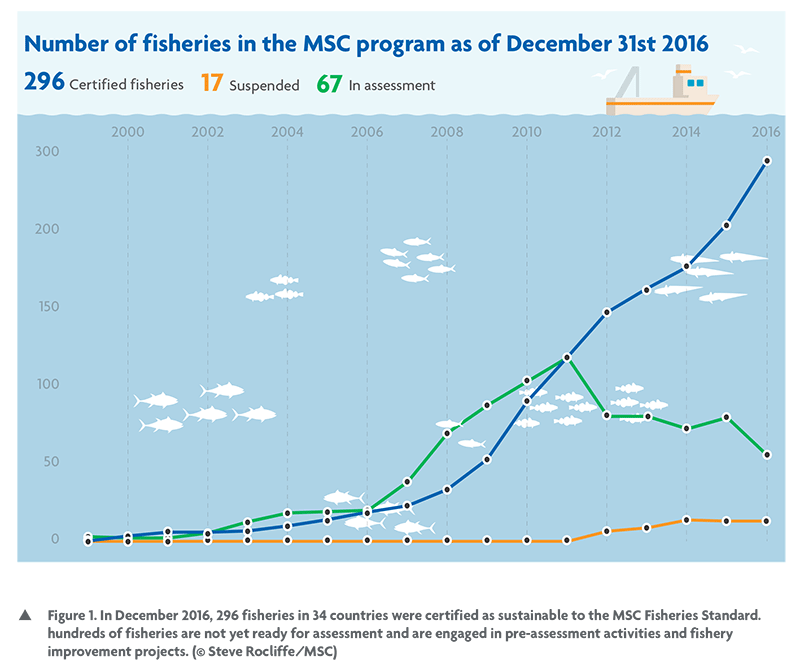 Of the sustainability improvements made by MSC certified fisheries,117 actions by 39 fisheries contributed to improving habitat status, management and information. In total, MSC certified fisheries have been involved with 46 new scientific research projects as part of efforts to better understand and minimise impact on habitats. The certification process often facilitates partnerships between the fishing industry and environmental scientists. 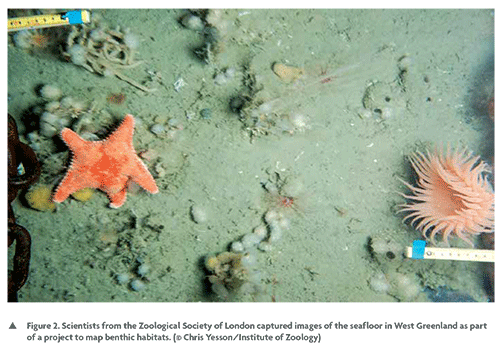 For example, a recent collaboration between the Zoological Society of London and Sustainable Fisheries Greenland uncovered new information about seafloor habitats in Arctic waters (Figure 2), leading to the designation of a Marine Protected Area to safeguard corals and sponges, and ensuring the long term sustainability of the fishing fleet7. As advances are made in fisheries and environmental science, the MSC Fisheries Standard (Box 1) is continually updated to reflect evolving best practice. Stakeholders, including a broad range of scientists, contribute to these changes through the MSC’s policy development process. MSC certified fisheries can also help to deliver sustainable development targets relating to food security and sustainable economic growth. Maintaining or rebuilding fish stocks to sustainable levels is essential to ensure the long term availability of food8 and good scientific advice underpins the ability of fishery managers to deliver effective management practices. In this way, marine and environmental scientists, along with the growing number of MSC certified fisheries, play a key role in delivering SDG targets. Although these are not guaranteed, many fisheries,traders, processors and retailers have experienced economic benefits, including access to preferred markets and price premiums, as a result of MSC certification. Amongst these is the South African hake trawl, where a recent analysis concluded that losing MSC certification would result in a 37.6 per cent loss of value over five years, and put 5,000-12,000 jobs at risk9. However, while the intended environmental impacts of the MSC program are clearly prescribed, the social and economic effects that emerge from its implementation are variable and context-specific. The MSC is currently developing a method to study the emergent effects resulting from certification in order to offer a more holistic evaluation of its impact, and to evaluate how efforts to improve environmental sustainability affect social and economic development goals. Recent research in the journal Science highlighted how comparatively little research has been undertaken on the social dimension of seafood sustainability10 and we hope that our project will contribute to fill this gap. In 2016, the largest ever global analysis of attitudes to seafood consumption was carried out on behalf of the MSC. The research found that sustainability is a key driver for seafood purchase. Across 21 countries, sustainability was rated as more important than price and brand, with 72 per cent of seafood consumers agreeing that in order to save the oceans, shoppers should only consume seafood from sustainable sources11. Using credible sustainability standards is one of the most concrete and direct ways for businesses, from independent restaurants to multi-national corporations, to contribute to Goal 12 (Responsible Consumption and Production)6. As part of the latest GlobeScan/ SustainAbility Survey (March 2017), 500 sustainability professionals were asked which Goal was the most important for society to focus on in order to achieve the greatest progress towards sustainable development. Goal 12 was ranked joint third out of 17 goals, highlighting its importance12. As a market for sustainably produced goods enables economic benefits for certified fisheries as well as positive change on the water, consumers help to deliver the Goals by choosing to purchase traceable and sustainable seafood. In order to restore overfished stocks by 2020 and achieve the targets set within Goal 14, recent research from the FAO concluded that greater emphasis must be placed on replicating successful sustainable fisheries policies from developed countries across to the developing world2. This can be difficult due to challenges with governance, data availability and management systems in less developed countries. The MSC recognises the need to address these challenges and ensure the sustainability of small-scale and developing world fisheries. To this end the MSC’s Developing World Program includes initiatives such as capacity building training, fishery improvement tools and a risk-based framework for assessing data deficient fisheries; all aimed at improving the accessibility of certification. 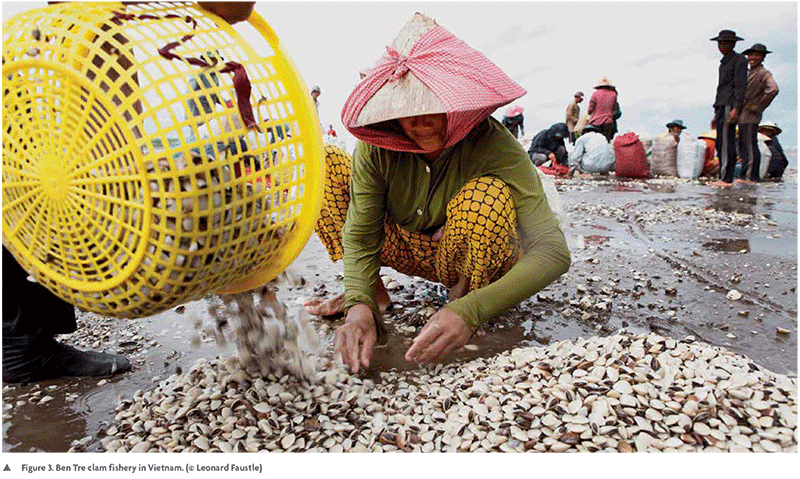 Vietnam's Ben Tre hand gathered clam fishery was the first small scale fishery in Southeast Asia to achieve MSC certification (Figure 3). Climate change is also an area of growing concern. In the 2017 GlobeScan/SustainAbility Survey, Goal 13 (Climate Action) was considered to be the most important goal for society to focus on in order to achieve sustainable development12, and climate-related impacts are becoming increasingly important for fishery scientists and managers. The ecological sustainability required for MSC certification can help mitigate negative impacts by improving the resilience of fisheries and marine ecosystems in a rapidly changing world. Fisheries and marine ecosystems are vital for ocean health, food security, and economic development, so it is critical that they are managed sustainably. Goal 14 is integrated with and indivisible from other goals that focus on poverty, hunger, decent work, sustainable consumption and climate action. Credible eco-labelling and certification programmes, such as the MSC, are one tool to enable fisheries scientists, conservation practitioners and social scientists to join with industry, governments, businesses, non-governmental organisations and consumers to deliver the SDGs. Lucy Erickson is the Science Communications Manager for the Marine Stewardship Council and formerly a freelance writer based in the fishing village of Mũi Né, Vietnam. Lucy holds an MSc in Biodiversity, Conservation and Management from the University of Oxford. This article is taken from the September 2017 edition of the environmental SCIENTIST. Ye, Y. and Gutierrez, N. L. (2017) Ending fishery overexploitation by expanding from local successes to globalized solutions. Nature Ecology & Evolution, 1, 0179. Lallemand, P., Bergh, M., Hansen, M., and Purves, M. (2016) Estimating the economic benefits of MSC certification for the South African hake trawl fishery. Fisheries Research, 182, pp.7-17. Kittinger, J. et al. (2017) Committing to socially responsible seafood. Science, 356 (6341), pp.912-913. Analysis: What is an ecosystem approach and why is it important?